Browse: Home / google_socks A proof of concept demonstrating the use of Google Drive for command and control. 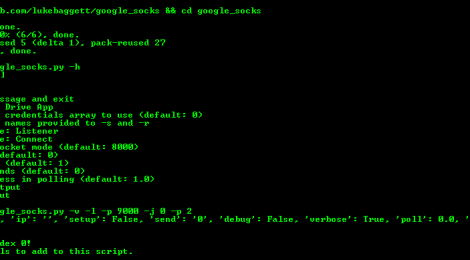 google_socks The script starts up a Python socket object, and each set of new data from the socket is pushed to drive as a new file of a specific name. Each script knows what files to read due to their names. + Use Linux For Run this script for worked well. + If you need to send data as fast as possible, set no polling (-P 0) or jitter (-j 0). If you get an error from going over the API rate limit, try raising your polling time little by little until you find a sweetspot. I found .2 seconds worked well. ← Scrapper for Realtime Attacks and Malware Spread Data.